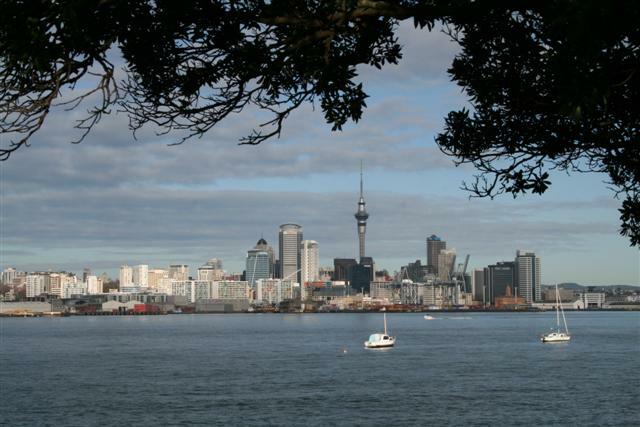 For the second time, Auckland, New Zealand’s largest city, has been voted third best city in the world to live. 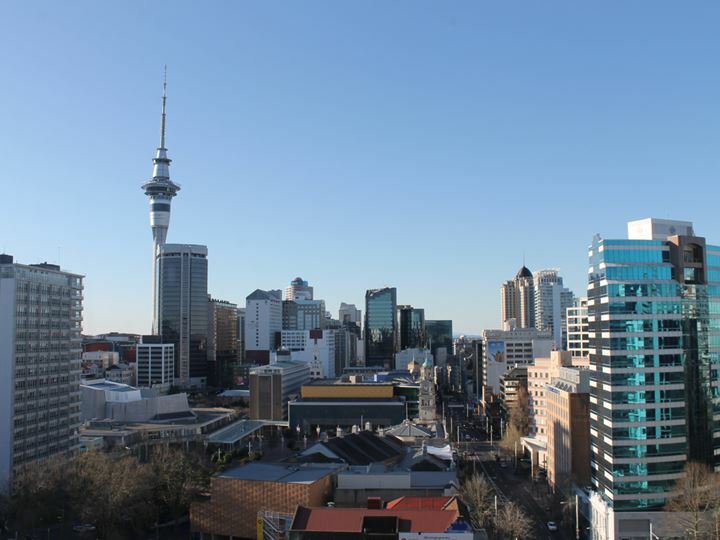 Behind Vienna and Zurich, international consultancy company Mercer ranked Auckland the third best city in their reputable Quality of Living Index. 450 cities were surveyed but only two non-European cities made it into the top 10 (the other was Vancouver). In 2014, Auckland was also voted in 3rd place in the same index. Auckland is now a major international destination with 34 airlines flying into the airport. In fact, Qatar Airways operates the world’s longest flight to the city, direct from Doha. In 2013, Auckland airport was voted the 12th best in the world at the annual Skytrax World Airport Awards. With almost half the entire population of the country expected to live in Auckland within a decade, this South Pacific metropolis with a population nearing 1,500,000, is quite different from any other part of New Zealand. Compared to noted European cities, Auckland has the same population as Munich and is larger than Amsterdam, Stockholm and Copenhagen. Auckland is the largest Polynesian city in the world, but in the past decade, the Asian population has increased to over 300,000, giving the central city, where many of them live in high rise apartment buildings, more of an Asian look than a Polynesian one. The city is home to three large universities with two of them located in the CBD. The thousands of students who attend these universities give central Auckland a youth generated energy not found in any other New Zealand city. William Hobson, the first Governor of New Zealand, declared Auckland his new capital in 1841 after shifting it south from crime ridden Russell in the Bay of Islands. Auckland remained the capital of New Zealand until the government moved to Wellington in 1865. Hobson named the new settlement after the First Earl of Auckland who was Governor General of India at that time. The new town grew rapidly because of its easy harbour, temperate weather and relative safety from Maori opponents to foreign intrusion. Navigation company Tom Tom declared Auckland the 22nd most congested city in the world. This makes it worse than New York which came in as the 39th most congested city. Yiks!! New Zealanders living outside Auckland derogatorily call an Aucklander a ‘Jafa’ which is short for “just another f****ing Aucklander”. Because of the city’s size and unique atmosphere, as well as its substantial non Kiwi population, many living in Auckland tend not to consider themselves true Kiwis. In fact, it is believed the majority of new citizens to the city have not traveled south of the Bombay Hills, which indicate the southern border of the urban sprawl. They tend to spend their holidays visiting family and friends back home in India, China, Malaysia, Thailand and Korea. 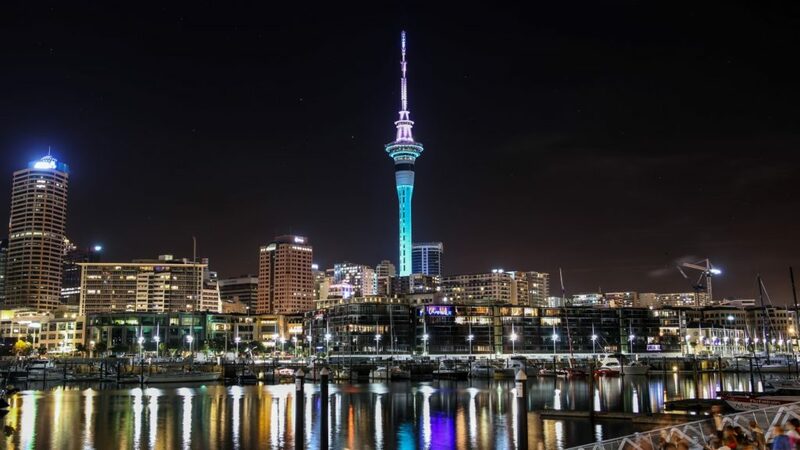 From my experience with overseas visitors to New Zealand, many regard Auckland as a stopover to recover from the long flight before touring around the country. In other words, the city has not been a destination in its own right but this is changing as more attractions are created in the city making it a destination in itself. The pace of life in Auckland is noticeably faster than in the rest of the country. Having said that, Aucklanders have to cope with traffic congestion and queues in supermarkets and car parks. dotted around the urban area. These are manifested in cones, craters and lakes and add to the city’s distinctive visual character. The numerous cones are particularly distinctive because development is not allowed on any of them. All are grass covered and are ideal places for picnics, walking and vantage points for taking photos. The summit of Mt. 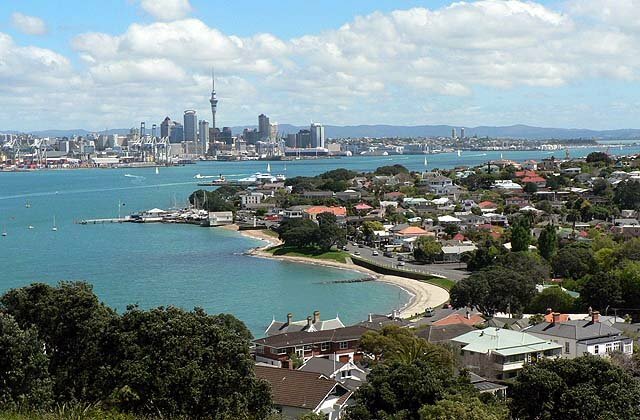 Victoria on the North Shore offers some of the best views across the Waitemata Harbour to the central city skyline. I lived in Devonport at the base of Mt. Victoria for three years and during the summer months, there was usually a queue of cars waiting to negotiate the narrow road to the summit. Waves of day trippers made the 12 minute ferry ride from the CBD to Devonport for the same spectacular views. 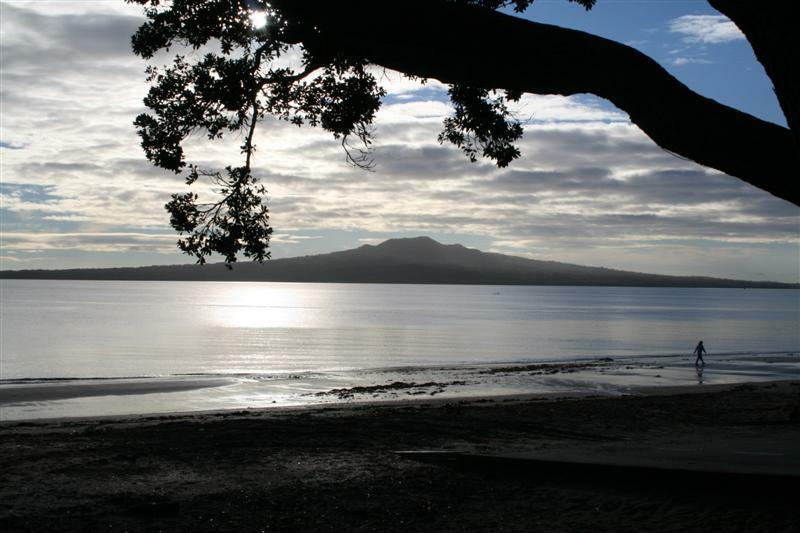 Rangitoto is the youngest volcano and is the city’s best known natural landmark. It sits in the centre of the harbour and over the summer months it is popular for day trips. Rangitoto is classed as a dormant volcano, rather than extinct. This means there is a possibility of future eruptions. It was last active 550 years ago. There are a number of seismic monitors placed around the urban area to warn of any underground activity so locals can be assured they are safe in their beds. Rangitoto can be seen from many parts of the city and is a scenic backdrop to Takapuna Beach, one of the busiest of the 52 beaches around Auckland. The city straddles a narrow isthmus with the wild Tasman Sea belting angry waves onto the west coast beaches. In contrast, the gentle, sparkling waters of the Pacific Ocean lap the sands of the city’s more popular eastern beaches. 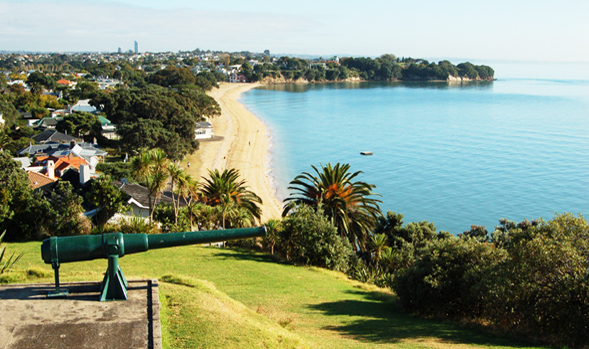 The city has a mild climate so Aucklanders love to use their attractive beaches to sunbathe or to swim. One of my favourite beaches is at Cheltenham on the North Shore. I used to amble along it frequently when I lived nearby for a few years. It was always a delight to experience the special peace it offers. Many city beaches are fairly crowded, even over the winter months but for some reason, Cheltenham was always delightfully uncrowded. New Zealand twice won the America’s Cup and as a result, part of the inner city’s water front was transformed from a rundown fishing depot into a sophisticated residential precinct. 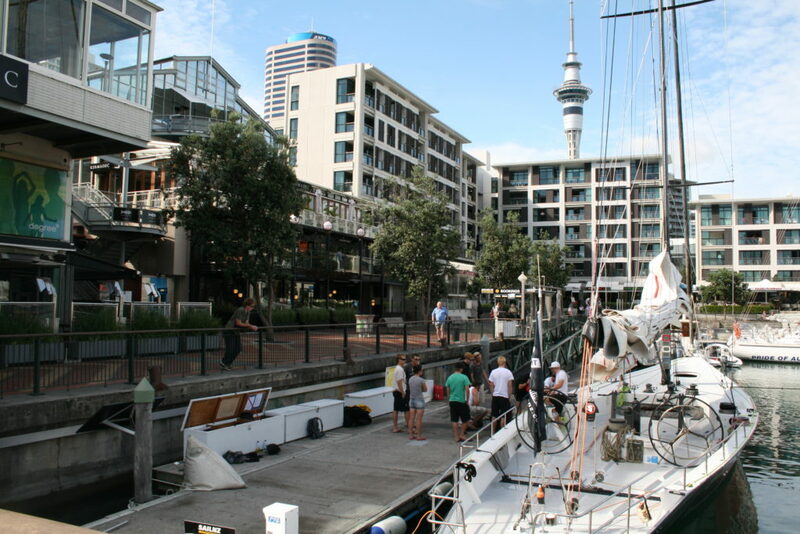 The Viaduct Basin is now one of the city’s prime entertainment areas, filled with waterside bars and restaurants, as well as international hotels. It is a busy summer base for super yachts. The Viaduct is also home to the Voyager Museum which has a special wing dedicated to New Zealand hero, Sir Peter Blake, the man who brought the America’s Cup to New Zealand. Antique vessels are still worked on the harbour in front of this maritime museum. Another part of the Viaduct Basin has been more recently developed into the Wynyard Quarter, for extra entertainment, outdoor theatres and eating areas. A walkway has been created between Wynyard Quarter and the nearby Westhaven Marina. Home to 2000 boats, Westhaven is the largest marina in the southern hemisphere. 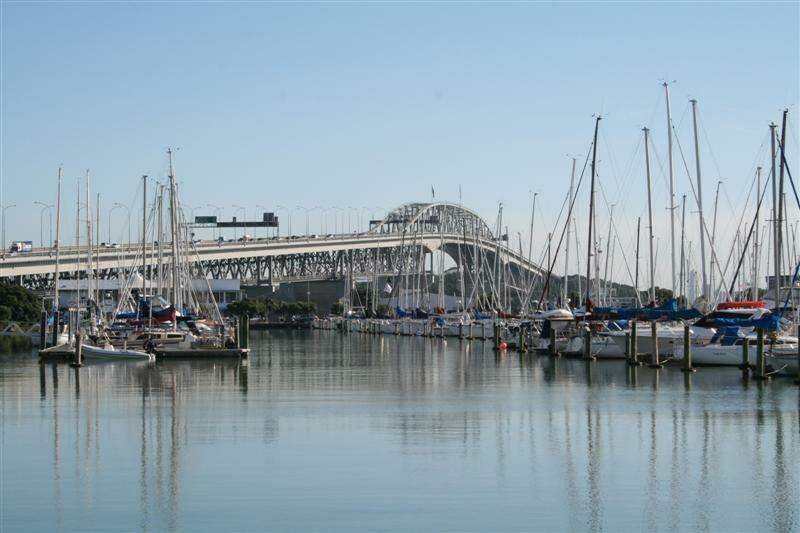 Auckland is often called ‘The City of Sails’ and has a number of other large marinas. Space in them is at a premium as the city’s boat population increases in step with the human population. The six lane harbour bridge connecting the city to the North Shore, is the only harbour bridge in the world offering bungy jumps, and the only bridge climb in the country. By the end of 2017, it will feature a light display to rival the Eiffel Tower. Auckland is instantly recognized by the Sky Tower, the tallest manmade structure in the southern hemisphere. The Sky Tower rises 1,076 feet with a cafe and two restaurants on the upper levels. One restaurant rotates slowly during a dinner, revealing the impressive urban sprawl in all directions. There are also two levels of observation decks near the top as well as a skywalk for the more adventurous. 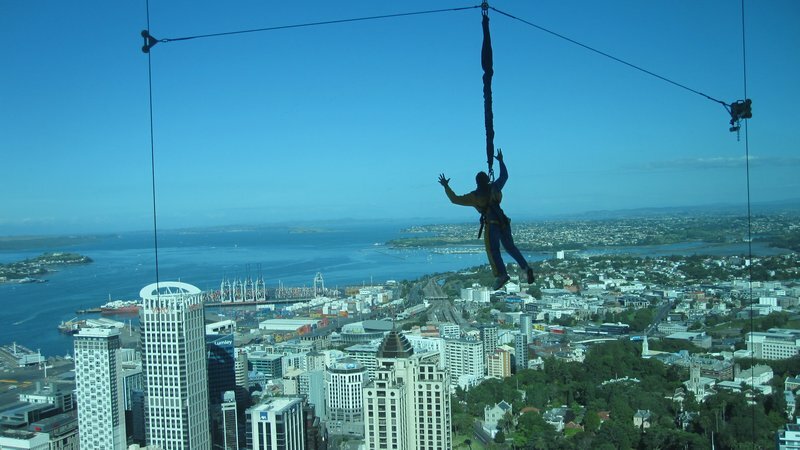 In the past few years, the Sky Tower has become internationally recognized for offering the world’s first urban bungy jump. Visiting celebrities seem keen to be photographed as they plummet to the ground down the side of the tower. Singer Beyonce made a well publicized jump when she was in Auckland last year. In the last twenty years people began to realize how much the city had lost and a preservation movement arrived on the scene to try and save the few historic buildings that remained. 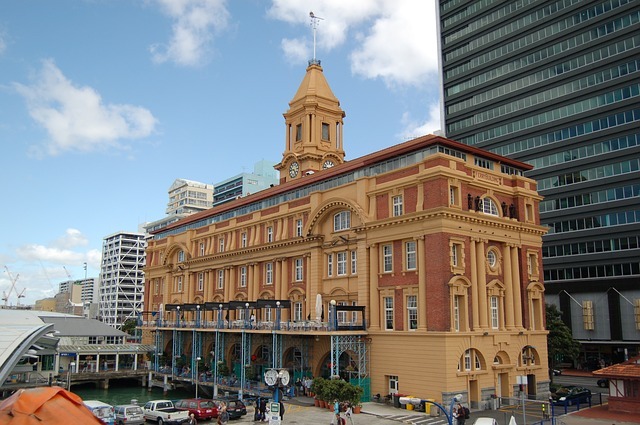 My favourite old building in Auckland has to be the historic Ferry Building. Constructed in 1912, this attractive structure on the waterfront is beside the busy ferry terminal and houses a couple of expensive eateries. It is an architectural gem among the modern high rises all around it. When one of the city’s last historic pubs was threatened with demolition to make way for a motorway tunnel, Aucklanders protested. As a result, developers paid for an expensive move. 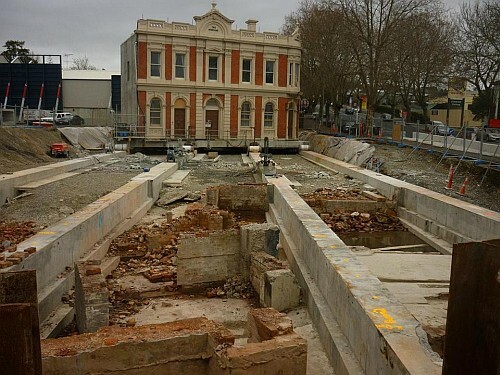 It took a week to carefully slide the double storied brick building forty metres out of the way. When the road works were completed, the old hotel was slid back into its original position where it is hoped it will see out another century. I’ve lived in Auckland for the past decade and have noticed incredible changes. 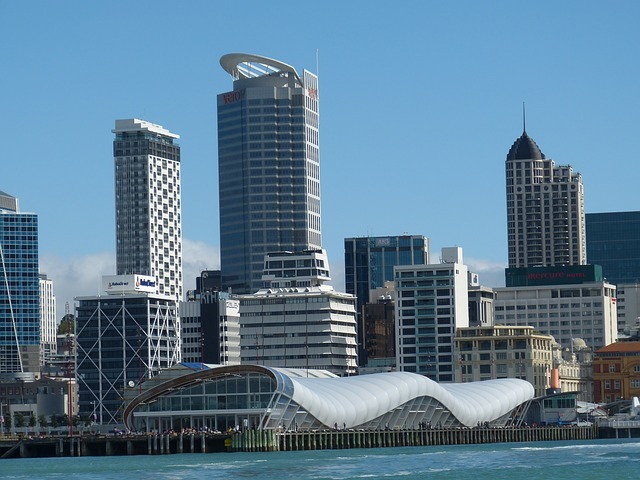 Having lived and worked in a number of cities including New York, Hong Kong, Toronto, New York and Dubai, I can honestly say, Auckland now has restaurants, pubs and cafes as good as any found in these cities, and of course, Auckland has its dramatic location at the top of New Zealand surrounded by two oceans. No other city can boast that!